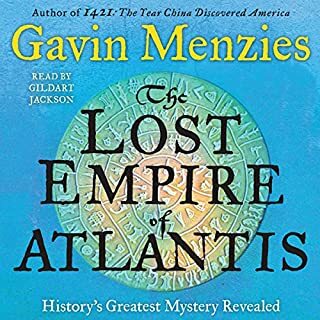 New York Times bestselling historian Gavin Menzies presents newly uncovered evidence revealing, conclusively, that “the lost city of Atlantis” was not only real but also at the heart of a highly advanced global empire that reached the shores of America before being violently wiped from the earth. For three millennia, the legend of Atlantis has gripped the imaginations of explorers, philosophers, occultists, treasure hunters, historians, and archaeologists. Until now, it has remained shrouded in myth. Yet, like ancient Troy, is it possible that this fabled city actually existed? In the early 18th century, the Pirate Republic was home to some of the great pirate captains, including Blackbeard, "Black Sam" Bellamy, and Charles Vane. Along with their fellow pirates - former sailors, indentured servants, and runaway slaves - this "Flying Gang" established a crude but distinctive democracy in the Bahamas, carving out their own zone of freedom in which servants were free, blacks could be equal citizens, and leaders were chosen or deposed by a vote. The New York Times best-selling author of Turn Right at Machu Picchu sets out to uncover the truth behind the legendary lost city of Atlantis. A few years ago, Mark Adams made a strange discovery: Everything we know about the lost city of Atlantis comes from the work of one man, the Greek philosopher Plato. Then he made a second, stranger discovery: Amateur explorers are still actively searching for this sunken city all around the world, based entirely on the clues Plato left behind. 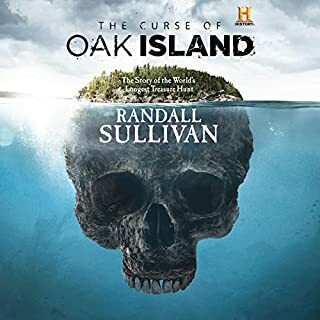 Exposed to the Atlantis obsession, Adams decides to track down these people and determine why they believe it's possible to find the world's most famous lost city and whether any of their theories could prove or disprove its existence. He visits scientists who use cutting-edge technology to find legendary civilizations once thought to be fictional. He examines the numerical and musical codes hidden in Plato's writings, and with the help of some charismatic sleuths traces their roots back to Pythagoras, the sixth-century BC mathematician. He learns how ancient societies transmitted accounts of cataclysmic events - and how one might dig out the "kernel of truth" in Plato's original tale. Meet Me in Atlantis is Adams's enthralling account of his quest to solve one of history's greatest mysteries; a travelogue that takes listeners to fascinating locations to meet irresistible characters; and a deep, often humorous look at the human longing to rediscover a lost world. 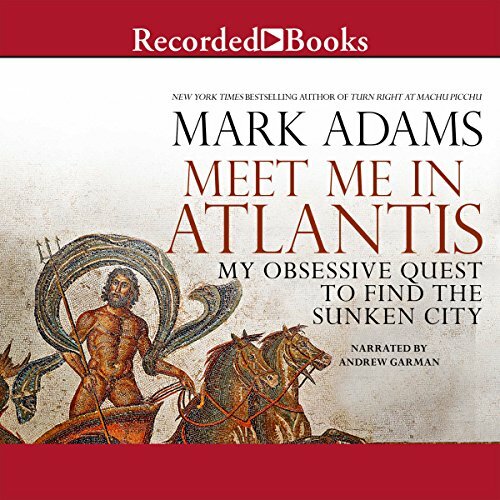 There is something about ancient mysteries that proves to be an irresistible draw for many of us and that really is what Mark Adams' exploration into the legend of Atlantis is about. If you're looking for a book about the woo woo world of ancient aliens, super beings or alternate dimensions, this will not be the book for you--although there are brief forays into the beliefs of Madame Blavatsky, Edgar Cayce and even Nazi Occultists (who believed that the "superior" Aryan race was descended from the inhabitants of Atlantis). Rather, Adams engages us in a thoughtful and intelligent quest into the meaning of Atlantis and its potential reality. Large sections are devoted to an analysis of Plato's writings on the topic (our sole source for the existence of Atlantis) as well as the writings of other contemporary philosophers and historians in the ancient world. We also learn a lot about the history of the ancient world culturally, meteorologically and geologically. Adams explores current thinking about the topic, interviewing archeologists, scientists (including a physicist whose interest in Atlantis was initially spurred by a Scrooge McDuck cartoon) and a plethora of amateur investigators. He treats his subject seriously and with an open mind as to the possible origins and veracity of the legend. 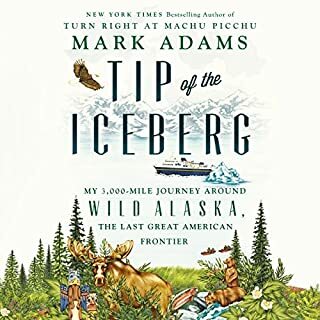 The book can be pretty dense at times and would have benefitted from an accompanying pdf with maps and diagrams of some of the concepts, but Adams does a good job of not overwhelming the reader with technical information--breaking it up with often humorous descriptions of his travels. I learned a lot from this book and not just about Atlantis. Narration is excellent. A good and thought-provoking read. 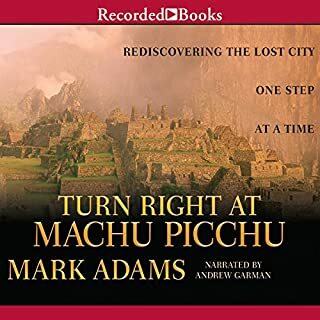 Adams is a talented writer, as anyone who read his previous book, Turn Right at Machu Picchu, can attest. He writes with wit, enthusiasm and a healthy skepticism (arguably a little too healthy at times) and although the enduring mystery of Atlantis lies at the heart of this book, it's really Adams' journey to learn about that mystery, and the fascinating people he encounters and interviews along the way, that make it such a good read/listen. Through those people, serious, devoted researchers into Atlantis, we get some insight into possible locations for the fabled land while also developing an appreciation for why they search. Adams develops that appreciation too, and eventually, he's drawn into the search and dreams of finding Atlantis himself. The end, of course, is unsatisfying, as it must be without a real resolution on the subject. 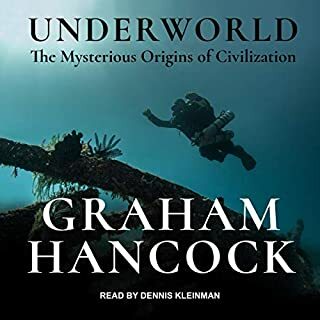 Atlantis remains an unsolved and much-debated mystery but this book provides an excellent, entertaining overview and it's anything but dull or dry. Highly recommended. Andrew Garman does an excellent job as the narrator. When I started the book I wondered whether it would veer towards crystals-and-harmony New Age acceptance of Atlantis or else be a mocking catalog of crazy Atlantis belief; but, to my surprise, it did neither. Instead, we are treated to a witty travelogue in the spirit of Bill Bryson - a well-written and thoughtful discussion of scholarly (and serious amateur) efforts to locate the source of the Atlantis myth interspersed with personal asides and observations. Adams takes us on a tour of candidate locations, and gives us sharply written encounters with the people behind each potential theory. It is a fascinating (and fun!) listen. The book hinges on the account of Atlantis in Plato, and, as a result, there is a lot of deep discussion of Plato and his beliefs in an attempt to identify the truth behind the accounts. Along the way, we are treated to bits on volcanology, archaeology, ancient trade routes, and 19th century cranks. It may sound dry, but it is almost all told in a breezy, entertaining style, focused around interviews with interesting people. Surprisingly, it also takes the subject seriously: Adams actually draws some conclusions at the end that wraps things up on a (relatively) satisfying note. The reading is also excellent. Overall, a great find for anyone looking for witty history with a personal flavor, I am really happy I found it. This was a little dry, but I've always been interested by the idea that certain legends and myths have a genesis in real events. Adams has spent a lot of time interviewing experts and scholars, some quacks, regarding this subject. Will we ever really find Atlantis? Perhaps not, but it does seem plausible that somewhere at sometime there was a place where a great disaster occurred and water covered up the land. Was this related to Noah's ark and other ancient flood stories? I think so. Which of any of these stories holds all of the truth? Well,I'm not sure that can ever be answered. I enjoyed listening to Mark Adams's journey. He assumes the pose an intelligent everyman, and buzzes around the world interviewing people engaged in the search for Atlantis. It's great fun to go on the journey with him. He admits that along the way, he got the bug of wanting to find Atlantis too. It is, after all, a lost utopia. I learned a lot about Plato, as well. Skillfully narrated by Andrew Garman. I hate criticizing this book because the author's research is EXHAUSTIVE. An excellent author and scholar who really worked to get to the bottom of his subject. However, the book was pitched as a "Bryson-esque" travel narrative. The moments of humor and wit are very few, and there is not much of any plot beyond the author's travel schedule. I struggled to listen to the end, and this read much more like a textbook than I expected. I suppose I was hoping for more Erik Larson and less Encyclopedia Brittanica. If you love research you will love this book, if you are looking for adventure writing or plot and mythology look elsewhere. Where does Meet Me in Atlantis rank among all the audiobooks you’ve listened to so far? I would put this book in the top middle of what I've listened to so far. The Topic is interesting and the narration is very easy to follow. What other book might you compare Meet Me in Atlantis to and why? This book reads almost like a travel log for an eccentric. It's full of anecdotes, stories, meetings with interesting people in exotic places. There is such a wide range of characters that pop up from time to time again and again, Garman seamlessly blended them into his work and so I could tell by their character voice alone who was doing the speaking. Fantastic. I had a few chuckle moments and a handful of smirks at witty comments or situations. This book is not what I expected but I still feel highly satisfied with it. I was expecting to find various tales of the people who have searched throughout the ages for atlantis. I did not expect that the story would be centered around the modern searchers! I found the insights into Plato's work to be both highly interesting and satisfying, especially if you are an amateur philosophy buff like I am. Now armed with so much new information, I'm really dying to visit some of the places mentioned in the book! An excellent compendium of the myth and those who seek its origins throughout the world. I bought this thinking it would be a simplistic explorer/adventure sort of book with interesting factoids, interesting places and odd people, and hoping it would be easily listenable. Well, it has all that, but what I didn't expect was a book that would leave me pondering the definition and significance of mythology, both in the ancient and modern worlds, and provide me with some significant insights into the minds of Plato and his contemporaries. 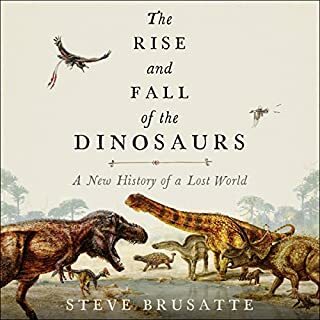 I didn't expect an engaging overview of the geography of the Mediterranean, and to some extent the world, during the bronze age, or of the nature of the volcanoes and earthquakes and how their effects shaped the mythologies which still underlie so much of our culture. This might not be as interesting to someone better educated in Greek philosophers and mythology than I, and as a neophyte I cannot attest to the accuracy or depth of the author's conclusions, but the book really stimulated my interest, made me want to know more, and that, by my standard, makes this a very good book. I found myself re-listening to significant portions of the book, and wanting maps and photographs of the places and people the author encounters. That lack of visual material would be a shortcoming, except, of course, I bought an audio book. You might want to have an atlas handy when you listen, I wish I had. The narration was very good, close to 5 star, but I try to reserve 5 star ratings for really exceptional work and it doesn't quite get there.